Concerned about your 2007 Phazer FX or Phazer GT overheating? 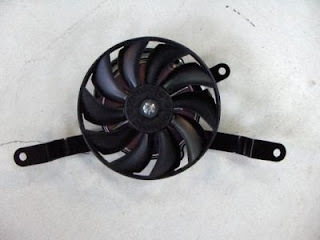 A Phazer engine cooling fan is the best solution. Snowmobiles perform best with lots of cold air running through them and snow thrown at them. If your riding style is to have a long runs followed by long idles, or if you are riding in southern climates with outdoor temperatures just below freezing, your snowmobile may be running a bit hot. Our Yamaha technicians developed a Phazer Cooling Fan solution. To install the cooling fan you need: 1 Fan, 3 bolts and 1 nut. Pick direct from our 2008 Phazer parts page, add to cart and see all prices including shipping before purchase. Fits: 2007 Phazer FX and Phazer GT. The 2007 Phazer model requires a long wiring harness in addition to the parts above, contact us for more details. View Yamaha snowmobile parts and microfiche on Yamaha parts pages.